OptinMonster offers seamless integration with ConvertKit email marketing service. Connecting OptinMonster to your ConvertKit email list is very easy. Follow our step by step guide on how to connect OptinMonster with your ConvertKit account. REQUIREMENT: Our native ConvertKit integration requires a Plus subscription. However, you can still use our Custom HTML integration with a lower subscription. 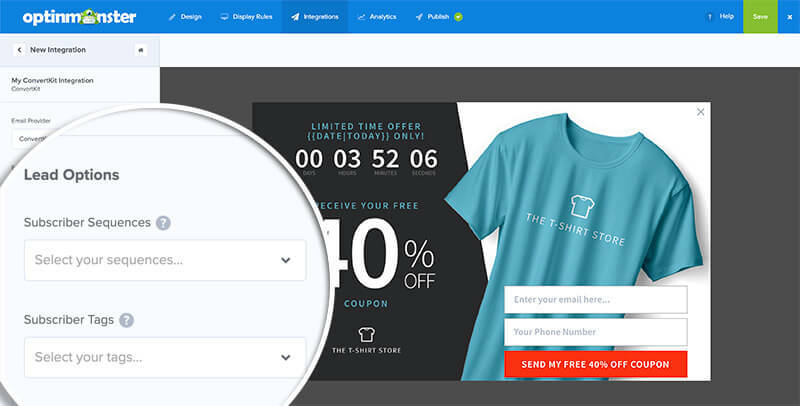 Next, select ConvertKit from the Email Provider drop-down. To obtain your ConvertKit API Key, log into your ConvertKit dashboard and navigate to your Account Settings page from the top menu. On the Account page, you will need to copy your API Key from the Account Settings section. In the Builder, paste your API Key into the corresponding field. Don’t forget to add an account label for easy identification! Then, select the Connect to ConvertKit button to connect your ConvertKit account with OptinMonster. OptinMonster will now connect to your ConvertKit account and fetch your email forms. Select an email form you want to add subscribers to. You can also optionally assign Subscriber Sequences and Subscriber Tags. That’s all, you have successfully connected OptinMonster to your ConvertKit account! A: See our guide on single vs. double opt-in for ConvertKit. A: Yes! You can add a phone field. Check out how to capture phone numbers with OptinMonster.